Darjeeling, situated at an altitude of 2,134 m, was developed by the British as a hill resort to escape the heat and rains of the plains. 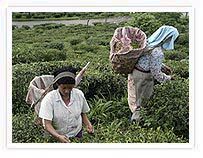 In the 1840s, tea plantation was introduced in the area. At the centre of the town is the Mall, Darjeeling's commercial street, lined with souvenir shops which leads to Chaurastha, a square with a bandstand and several antique shops. The Observatory Hill is perhaps the oldest built-up site in Darjeeling. A Red Hat Buddhist monastery, Dorjeling once stood here but was destroyed by the Nepalis in the 19th century. On Birch Hill to the north stands the Shrubbery, the residence of the Governor of West Bengal and further down along the Birch Hill Road is the Himalayan Mountaineering Institute previously headed by the late Tenzing Norgay. A museum displays the equipment used on the first successful expedition to Mount Everest. The nearby Zoological Park specializes in high-altitude wildlife - yaks, Himalayan black bears, pandas, but is also has four Siberian tigers. Below, the tea estate of Happy Valley is one of the best in Darjeeling and can be visited every day except Sundays and Mondays. Dominating the Mall is the Planter's Club, where planters from all over the area meet, particularly on Sundays. The Lloyd Botanical Gardens were laid out in 1878 on land donated by the owners of Lloyd's Bank. They present a collection of Himalayan and alpine flora. Nearby is the Tibetan Refugee Self- Help Centre with its temple, school, hospital and a shop selling carpets, textiles and jewelery. 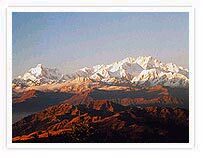 Mount Kanchenjunga can be seen from Observatory Hill but a much better view of the peak is from Tiger Hill, 10 km south of Darjeeling. On the way back, you can stop at Ghoom, a small Tibetan monastery by the roadside, built in 1875 and housing a 5- meter statue of Lord Buddha. After breakfast drive to Manaybhanjyang. The drive takes you down through Ghoom, Bhanjyang (pass) and to Sukhia Pokhari, literally meaning dried lake, a small town. There is a weekly haat (market-day) on every Friday where people from the surrounding areas (including the villages in Nepal) come to sell their farm produces. After a brief halt over here, we continue our journey to Manaybhanjyang, 2000 m, a border town between India and Nepal, mainly inhabited by Sherpas, Gurungs, Newars, Tamangs and a few Indian merchants from Bihar and Rajasthan. Your trek begins with a gradual ascent to Chitray, where we stop for lunch. Visit a small Sherpa monastery while lunch is being prepared. After lunch the trail ascends all the way to Meghma, 2,600 m., a Nepali village amidst a forest of rhododendron trees and bamboo groves. Here one can also get to see some fine specimens of Himalayan cobra lilies, orchids and daphne plants. If the caretaker is around, visit the Hoshel Dechenling Gompa, a Nyingmapa monastery built in 1953, now supported by the local Tamang community. A magnificent view of Kanchenjunga awaits you. From here the trail ascends to Tonglu (meaning the hill of fire). Tonglu, at 3070 m. overlooks the entire Darjeeling hills and offers another breathtaking view of the Kanchenjunga range including that of Darjeeling, Kurseong and Sukhia Pokhari towards the south. Day 04 : Kalo Pokhari : 3,000 m.
Rise early today for sunrise view. After breakfast descend towards Tumling, a Gurung village and then ascent for about two kilometers towards the viewpoint. After spending some time here, head on the trail that drops to Gairibas, 2,800 m., your lunch spot. There is a forest bunglow in this village. 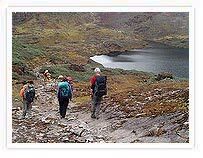 After lunch the trail ascends all the way through dwarf rhododendron forest to Kalopokhari, meaning black lake. This route is also rich in Primulae species, Impatients falcifer, Owl-eyed Impatiens, Sorbus, Pyrus, Enkaithus and Roscoea alpina. Your camp will be set beside the dark crystaline waters of Kalo Pokhari lake shimmering in the breeze and surrounded by alpine trees with the mountains looming across the horizon. Day 05 : Kalo Pokhari to Sandakphu : 3,636 m.
Today's trail ascends to Sandhakphu through magnolia, blue pine and rhododendron forest. Sandhakphu is the highest point in this trek and the reward for all the trudging culminates in a magnificent panorama of the eastern Himalayas of Nepal and Sikkim, from Everest in the east all the way to to Jhomolhari in Bhutan. After lunch we take an excursion around Sandhakphu, which is a veritable botanists' paradise. Apart from the different varieties of rhododendrons, plants like Streptous simplex, Trilidium govanianum, Primula rotundifolia, Fritillaria cirrhosa, Llydia and other flora like Anemone and Iris can be found here. Day 06 : Sandakphu to Phalut : 3,500 m.
An easy day's walk along the ridge through the forest of rhododendron, magnolia, chestnut, oak and silver fir to your lunch spot at Sabargram, 3536 m. All along, the imposing Himalayas loom large on the western horizon. After lunch, it is a short flat walk on the trail barring a gradual ascent finally before arriving at Phalut, a tri-junction point between Nepal, Sikkim and the Darjeeling District. Other than the different varieties of rhododendrons, you will also come across vaieties of Meconopsis, Primulae, Orchids, Parnassia etc. Day 07 : Phalut to Rammam : 2,453 m.
The trail goes all the way down through dense rhododendron forests and bamboo groves towards the village of Gorkhey. After lunch at Gorkhey, a short ascent will lead you to a picturesque village inhabited by Sherpas, Samanden, better known as the lost valley. Standing at a plateau in the middle of a dense forest this village is noted for it's fertile land. The trail then leads to Rammam, a small village inhabited by Sherpas and Tamangs. From here there is a good view of Sikkim's western hills. Today the trail descends through forests and villages leading to your lunch spot at Srikhola. This stretch is well known for its orchids and birds. After lunch we have an easy ascent through forest trails and terraced fields to Rimbik, 2,280 m., the main village of this area. Spend some time in the market and head towards Gumba Danda to camp. After breakfast drive to Darjeleing for an overnight stay.